I'm a sucker for a great makeup palette. If it looks sleek and pretty, that's great. If the colors inside actually look wearable, even better. And such is the case with the M.A.C Trip 4 Classic Eye and Cheek Palette. 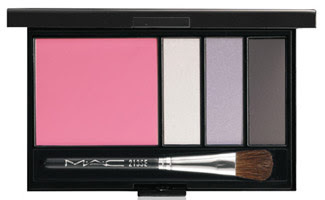 Part of M.A.C's Trip II collection, available from April-August at airport duty free shops, this palette contains four gorgeous shades for cheeks and eyes. Now, I know that the blush may seem scary at first glance. It is very, very, VERY bright pink. But if dusted across the cheeks with a light hand, it actually leaves a pretty "I stayed in the sun just a bit too long without wearing sunscreen and now my cheeks are very pink" flush. And the eyeshadows ... wow! From sparkly cream to shimmery silver and glittery charcoal, they're all unbelievably beautiful and perfect from day to night. I like to wear either the silver or grey shades with the cream swept on top for high-wattage sparkle that doesn't look too eveningesque in the daytime. And how can you pass up a lacquered black compact that comes with a miniature 213SE brush? The answer is, you can't!